Yea is a town 77 km north-east of Melbourne, centrally located in the former Yea shire (1873-1994). It dominated the shire in terms of population, as the other villages or localities of which there were more than 12, at no time have had over 200 persons, except Molesworth and district (212 in 1921). The first European settlers in the Yea district were two prominent pre-gold rush personalities of Port Phillip: Peter Snodgrass had a licensed run, Murrindindi, south of Yea (1837) and John Cotton had Doongallook, west of Yea (1843). Snodgrass married Cotton's daughter in 1846 and took over Doongallook in 1853 in joint ownership with Cotton's son. The township is on the Yea River where it is joined by several creeks. By 1855 there were a few buildings there, known as the Muddy Creek Settlement. Muddy Creek flows northwards from the Murrindindi direction. A government surveyor laid out a township, and it is thought that the surveyor, who was the guest of the Killingsworth station to the north-east, adopted the suggestion by the wife of Killingsworth's owner that the township be named after Colonel Lacy Yea, a Crimean War hero. Yea had been killed at Crimea five months before, and had been the commanding officer of the Victorian Surveyor-General, Andrew Clarke, in England. The first sale of town lots was in 1856. 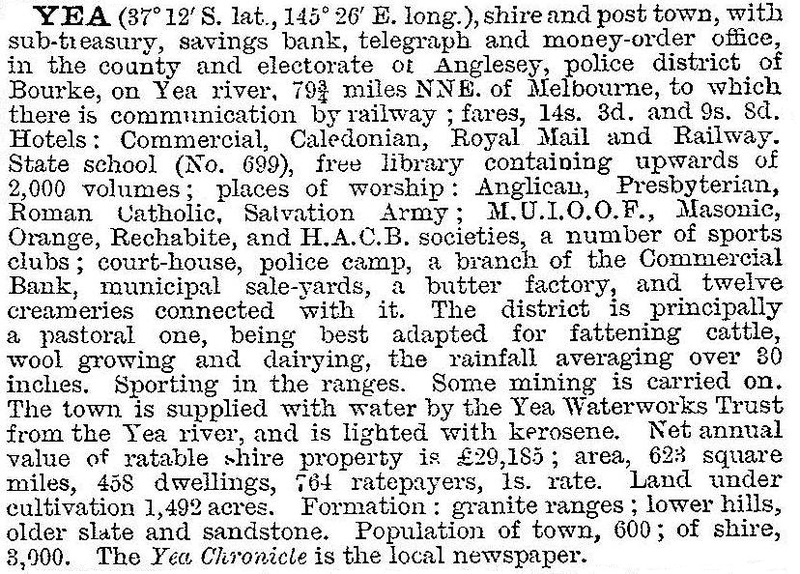 In 1908 rural water storage projects were being planned, and a proposal west of Yea at Trawool would have resulted in the inundation of Yea township. The Council persuaded the Government to choose Eildon, to the east. Electricity was connected to Yea in 1922, improved in 1926 and integrated with the State grid in 1944. In 1928 Yea won the Victorian Ideal Town Award. South-east of Yea is the Murrindindi forest and elsewhere there is some open woodland. A bushfire caused extensive loss in 1969, including the destruction of the Killingsworth homestead (c1848).The railway closed in 1978. The township has maintained a population of around 1000 persons since 1911 and has steadily added facilities for inhabitants and travellers. In addition to those already mentioned there are showground, golf course, race course, tennis courts, bowls club, indoor recreation centre, a Catholic primary school, two motels, four hotels, caravan park and an aged persons' hostel. The Yea chronicle is published weekly. Because of Yea’s steady population over the twentieth century there was little need to replace buildings or for buildings to fall into disuse. There is a heritage walk taking in over 20 sites, including the old shire hall, shops in High Street and several houses and a Yea Wetlands walk incorporating the Franklin Track. Yea primary school had 118 pupils in 2014 and Yea high school had 345 pupils in 2014. 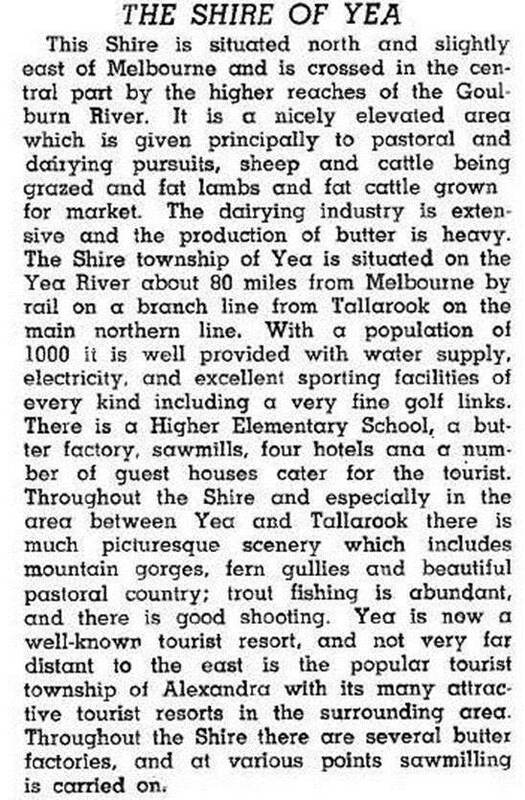 The Yea shire had 2600 people in 1911. There were numerous small settlements, nearly all with a school at some time and mostly opened between 1870 and 1890. By 1916, however, eight small schools had closed (including Doogalook, Murrindindi and Murrindindi West), leaving about eight others in the shire. Between 1907 and 1928 the shire's boundaries were diminished in the directions of Healesville and Alexandra (twice) and enlarged in the direction of Seymour shire. Despite all these events the shire's population remained at about 2600 from 1911 to 1961. Local dairying activities lessened, although the Yea and Mansfield Dairy factory in Rattray Street operated until the 1980s. In 1994, the year of its amalgamation into Murrindindi shire, Yea shire had 36,000 meat cattle and 1200 milk cattle. Sheep and fat lambs, however, were more numerous at 108,000. Of the 71,000 ha of farmland 40,000 ha were sown pasture. The total farm land was 51% of the shire's area of 139,232 ha. The Murrindindi forest, partly in Yea shire, had about 16,000 ha available for timber production, and some of its output was milled at Yea. In the south of the former shire, below Glenburn, is the Kinglake National Park (10,300 ha), and the adjoining Yea River Regional Park (200 ha). The southern part of the shire was about 50 km from Melbourne and shared the Kinglake locality with Eltham and Healesville shires. It was within acceptable commuting distance of Melbourne. The population of the Yea shire increased by 86% between 1961 and 1991, mainly in its southern part. On 18 November 1994, Yea shire was united with Alexandra shire and parts of Whittlesea city and Eltham, Euroa and Healesville shires to form Murrindindi shire. A number of houses were lost in Yea during the 2009 Black Saturday bushfires.